Mounds or Bounty? Doesn’t matter where we are in the world! 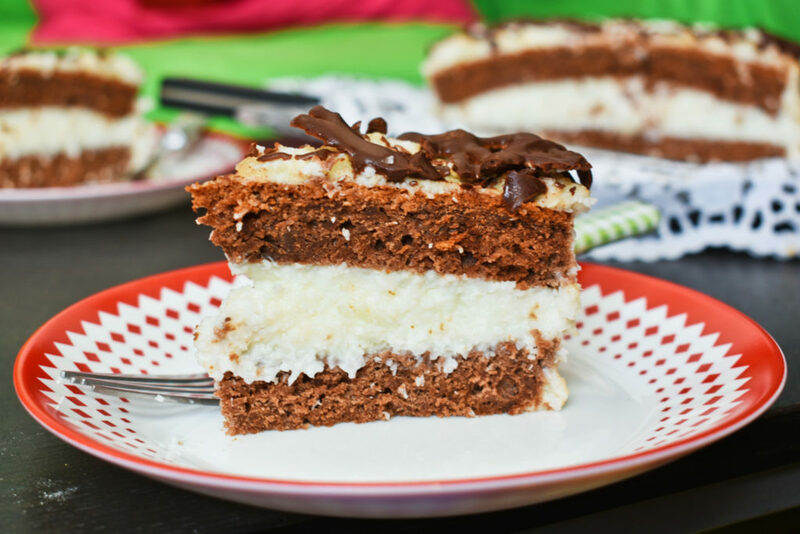 This moist chocolate and coconut cake will remind us what we love in those chocolate bars! The interesting thing is that Bounty made by an American manufacturer Mars is not marketed and sold in the US except by some import stores. Otherwise it’s a well-known brand and favorite in many overseas countries whereas Mounds is pretty much unheard of. In the states Mounds bars are so popular that they even found their way into pop culture featuring in Family Guy as Joe Swanson’s favorite candy bar. Candy bars are great on the go but why go small when we can go big at home? 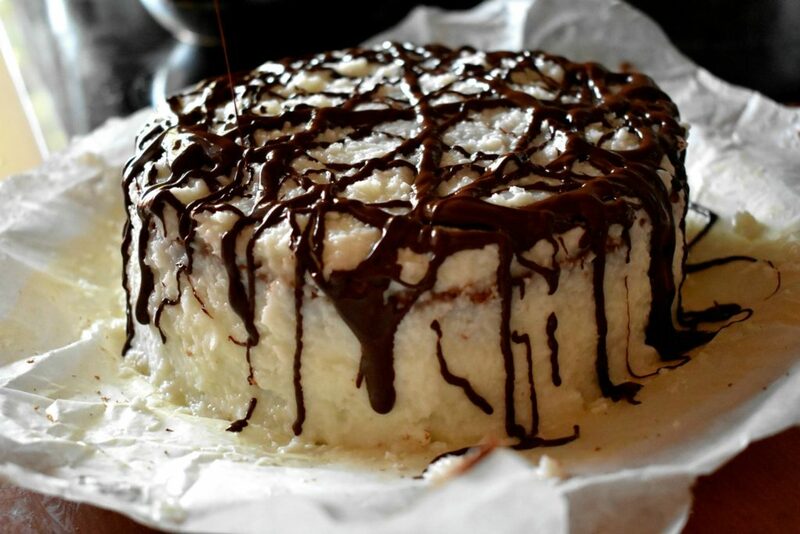 Chocolate coconut cakes are easy to make and taste just like chocolate coconut bars. Well, almost like the candy bars as this chocolate coconut cake recipe won’t stop just pouring chocolate on a heap of coconut and call it a day. 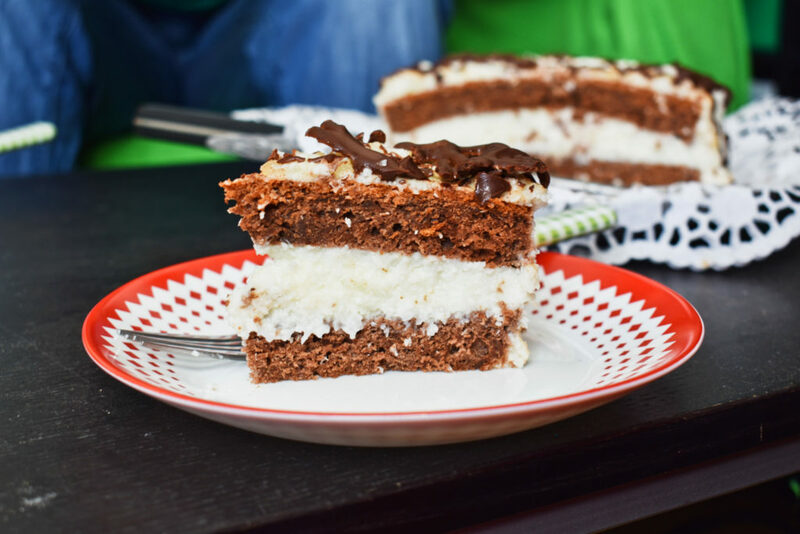 We’ll make a nice and sweet healthy chocolate coconut cake with natural ingredients in a way that could be presented on a birthday. Given the texture of the ingredients we don’t really have to put much effort to gain amazing returns. 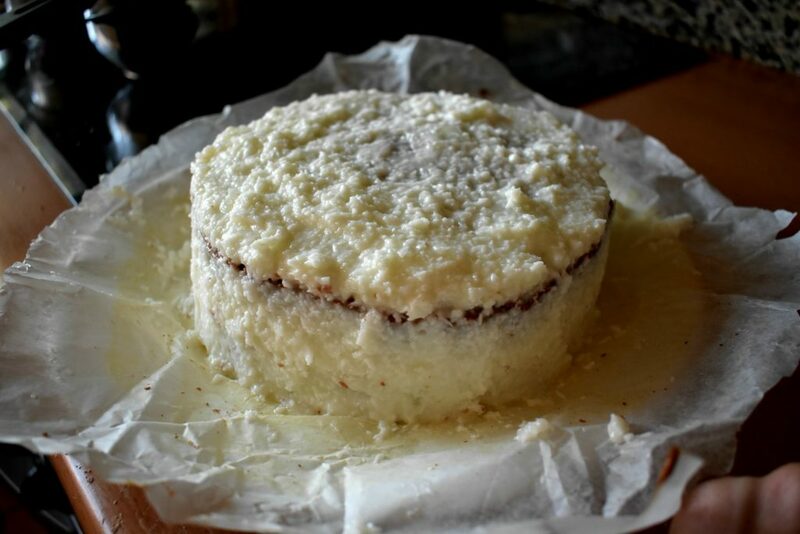 It’s an easy moist coconut cake thanks to the liquid that we use to soak the desiccated coconut in. 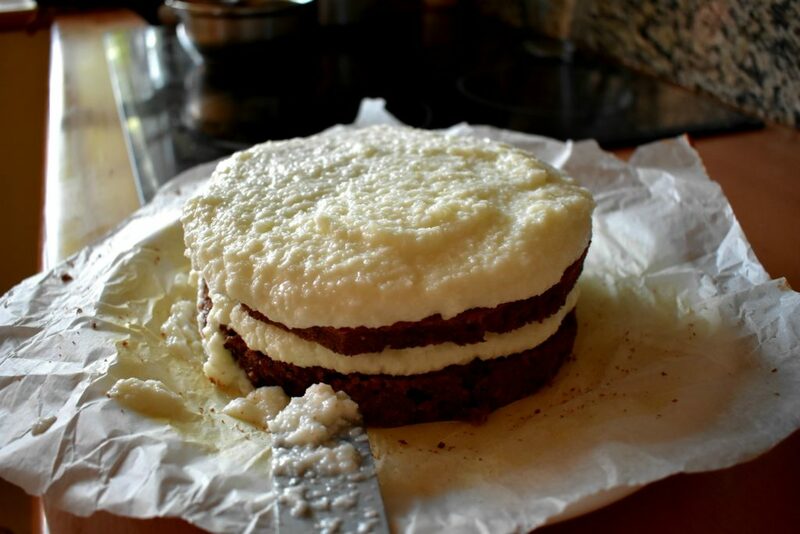 Also, the base made with butter that won’t let it dry out so quickly as sponge cakes do making it a dessert for days to come. Given that it can last that long of course. After baking the pastry, it is a good idea to cut it into a nice shape making our work easier with the filling. We can leave it as it is but bringing the filling up on the sides will be a bit more challenging not to mention creating an even looking top. So, the hardest part with this easy coconut cake recipe is spreading the actual coconut cream on top and on the sides. This is hardest part of all cakes because if we mess it up then all the hard efforts will be ruined by a single stroke of a spatula. Luckily this isn’t that hard as writing Shakespeare on a plain chocolate cake with caramelized sugar. The coconut mass is rough by nature and thus it’s quite forgiving. A spatula is highly recommended, but a wide knife would be good enough to bring the paste onto the side of our Mounds cake. We don’t need to scrupulously smooth every square inch. 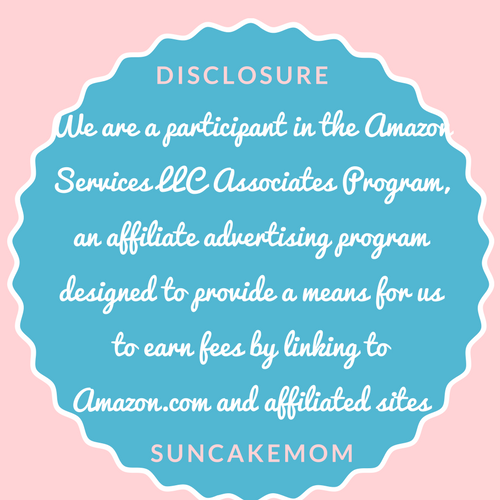 It’s more than enough if we aim for a smooth surface and go with that. It’s a good idea to dip the spatula into water before touching the coconut as water will prevent the cream sticking to it. After a couple of whims, we must scrape the restudies off the spatula and re-water it as clumps will stick to it preventing our aim to reach near perfect smoothness. The most satisfying part will be pouring the chocolate over the already scrumptious looking cake. It’s beautiful as the dark melted chocolate slipping through the white plainness of the cake breaking the evenness while the kitchen’s light shining of its surface. After pouring the desirable amount of chocolate on top and the sides, it’s advisable to stick our bounty cake into the fridge if we are not planning to cut it up and serve immediately. A bit of cold will do some good for the coconut cover as it will sort of shrink to the base snugly. So does the chocolate coating. It will harden back to chocolate form, so we don’t have to lick our fingers every time we accidentally touch it. This will make transportation much easier but less pleasureful for sure. 1. First of all, we”ll need 3 medium bowls to sort different cake ingredients in. 2. Mix unsweetened cocoa powder and warm water in the first bowl until we get smooth liquid without any lumps in it. Put it aside a bit to cool. 3. Meanwhile measure and mix flour with the baking powder. 4. Separate eggs. Beat egg whites until hard peaks form. 5. Whisk butter and honey with an electric-mixer until butter has a light yellow color. Then put yolks into the mixture one by one. Mix them well. 6. With the mixer on low speed, add flour in three additions alternating with the cocoa mixture, mixing each addition just until incorporated. 7. 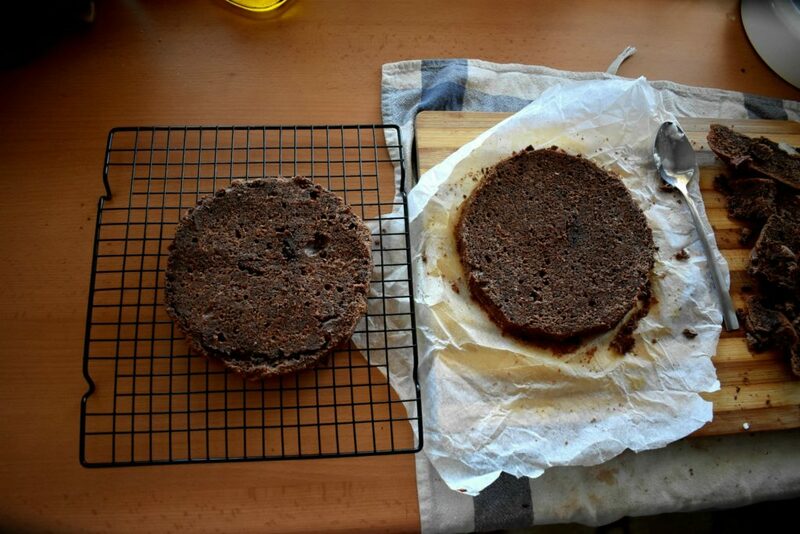 Pour batter into prepared round cake tin and put it into the 350°F / 180°C preheated oven. 8. Bake the cake for about 40 minutes or until a toothpick inserted in the center comes out clean. 9. When baked transfer the tray onto a wire rack and let it cool completely. 10. To make the filling, get a medium sized bowl to put shredded coconut, honey and cornstarch into it. 11. Pour about ½ cup / 100ml milk into it and blend them well with a wooden spoon until we have a smooth mixture. 12. Pour the rest of the milk into a saucepan to warm it before we put the coconut, flour and honey mixture into the bowl to boil. Whilst waiting for it to boil, whisk butter. 13. Put the coconut mixture into it and stir continuously until it bubbles. 14. Place it aside and wait until it cools down completely and ready to work with. Mix whisked butter evenly into the mixture for smoother consistency. 15. When cake cooled, get it out of the tray onto a wooden surface and cut it in half horizontally. 16. Divide the cream into two equal parts. One half will be the filling the other half is the topping. 17. Spread out one half evenly on the bottom of the cake. 18. Place it in the fridge for 10-15 minutes to have harder consistency (it helps to work with it later). 19. Place the other half of the cake on top. 20. Now it’s ready for the topping. Spread coconut cream on top to cover the cake completely. 21. Continue spreading the coconut cream on the side as well. 22. Break chocolate into pieces and put it into a small saucepan. 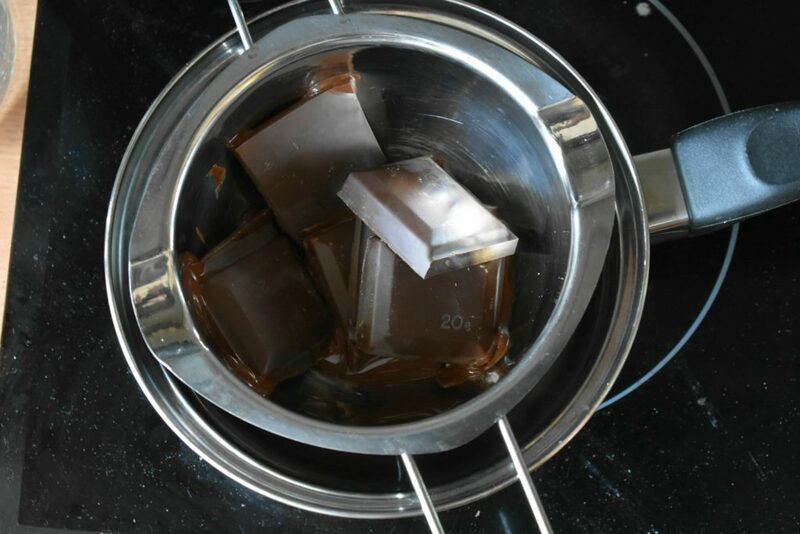 Place saucepan of chocolate on a slightly bigger saucepan of about ½ cup / 100ml water. Stir occasionally until melted completely. 23. 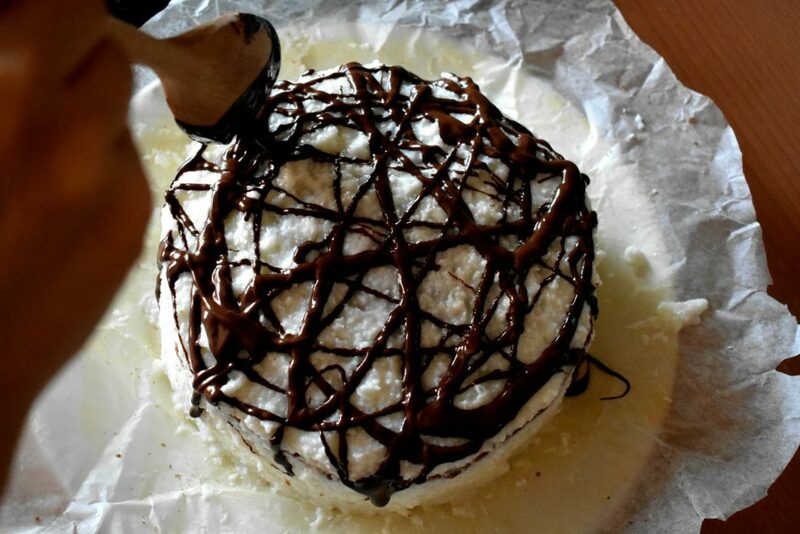 Use a spoon to decorate the top of the cake with the melted chocolate. Don’t forget to take care of the sides either. 24. When finished, put cake in the fridge until the chocolate gets solid again. Within an hour the cake is ready to be served. First of all, we”ll need 3 medium bowls to sort different cake ingredients in. Mix unsweetened cocoa powder and warm water in the first bowl until we get smooth liquid without any lumps in it. Put it aside a bit to cool. Meanwhile measure and mix flour with the baking powder. Separate eggs. Beat egg whites until hard peaks form. Whisk butter and honey with an electric-mixer until butter has a light yellow color. Then put yolks into the mixture one by one. Mix them well. With the mixer on low speed, add flour in three additions alternating with the cocoa mixture, mixing each addition just until incorporated. 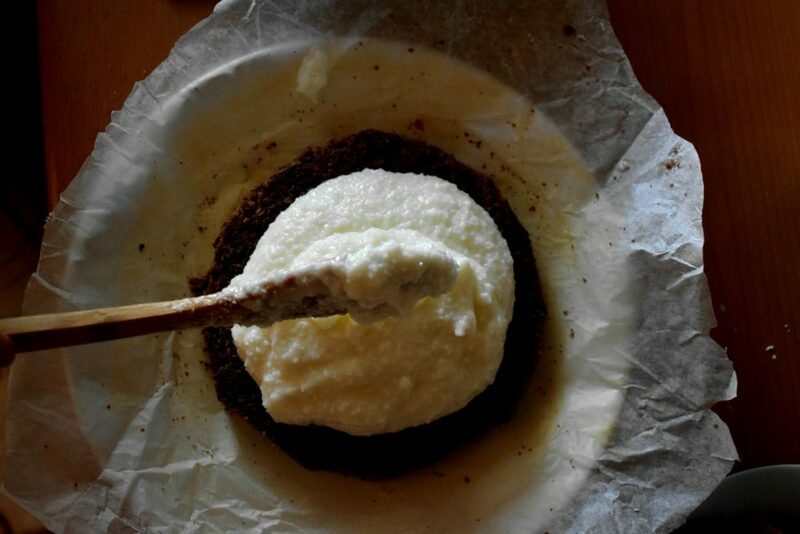 Pour batter into prepared round cake tin and put it into the 350°F / 180°C preheated oven. Bake the cake for about 40 minutes or until a toothpick inserted in the center comes out clean. When baked transfer the tray onto a wire rack and let it cool completely. To make the filling, get a medium sized bowl to put shredded coconut, honey and cornstarch into it. Pour about ½ cup / 100ml milk into it and blend them well with a wooden spoon until we have a smooth mixture. Pour the rest of the milk into a saucepan to warm it before we put the coconut, flour and honey mixture into the bowl to boil. Whilst waiting for it to boil, whisk butter. 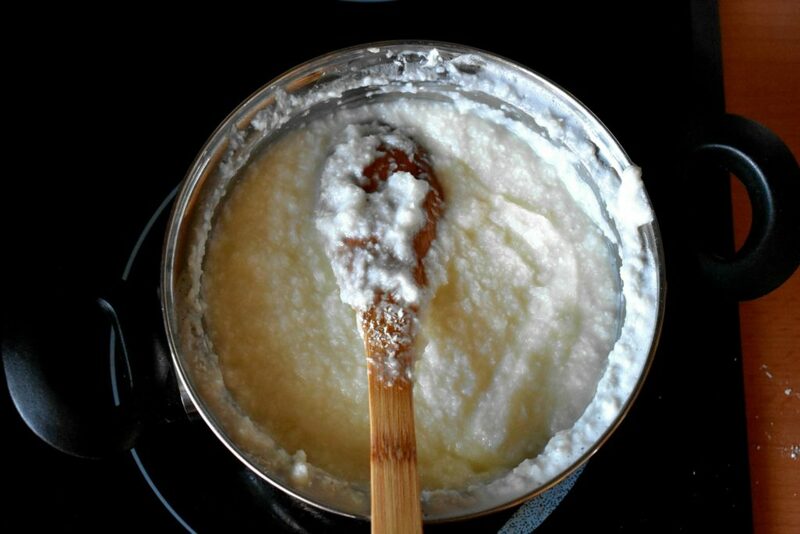 Put the coconut mixture into it and stir continuously until it bubbles. Place it aside and wait until it cools down completely and ready to work with. Mix whisked butter evenly into the mixture for smoother consistency. 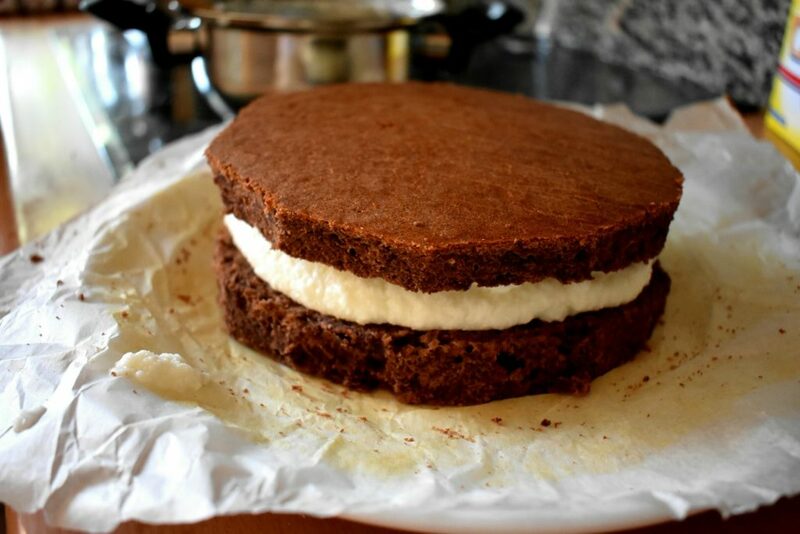 When cake cooled, get it out of the tray onto a wooden surface and cut it in half horizontally. Divide the cream into two equal parts. One half will be the filling the other half is the topping. Spread out one half evenly on the bottom of the cake. Place it in the fridge for 10-15 minutes to have harder consistency (it helps to work with it later). Now it’s ready for the topping. Spread coconut cream on top to cover the cake completely. Continue spreading the coconut cream on the side as well. Break chocolate into pieces and put it into a small saucepan. Place saucepan of chocolate on a slightly bigger saucepan of about 1/2 cup / 100ml water. Stir occasionally until melted completely. Use a spoon to decorate the top of the cake with the melted chocolate. Don’t forget to take care of the sides either. When finished, put cake in the fridge until the chocolate gets solid again. Dear Edi! I have to tell you that, I had doubts about how this delicious looking bunny will taste without sugar. Well, for my first attempt it turned out very tasty, the cake itself is very moisty just how I like it and the bitterness of the raw cocoa just melted together perfectly with the great coconut cream topping. Kudos for this recipe! I know!!! Isn’t it great that there is life after sugar. Greetings from Ohio! I’m bored at work so I decided to browse your blog on my iphone during lunch break. I really like the info you provide here and can’t wait to take a look when I get home. I’m shocked at how fast your blog loaded on my mobile .. I’m not even using WIFI, just 3G .. Anyways, amazing site!